Our bespoken furniture eCommerce platform serves as a one-stop shop to sell furniture online! 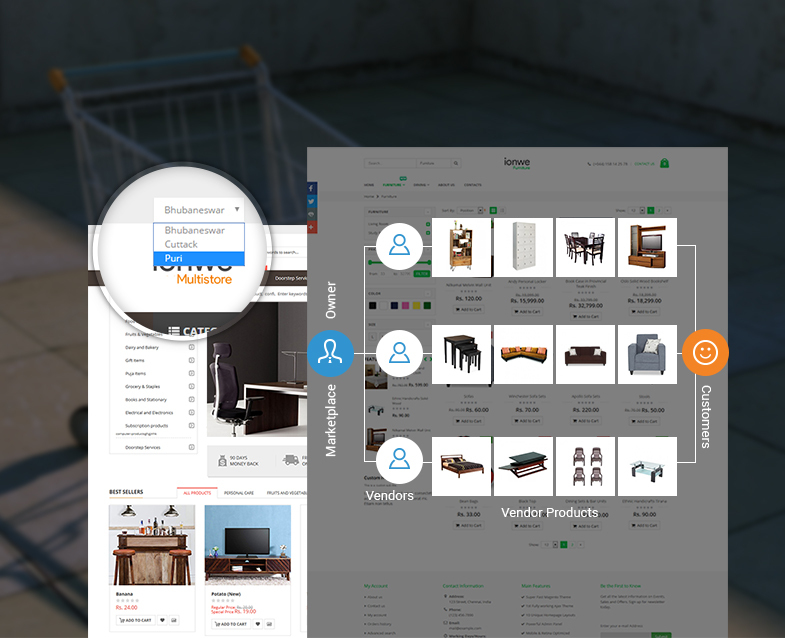 Custom-built ecommerce software with empowering features to showcase products specially tailored for furniture retailers. Set up and launch your online shopping store today to capture more furniture sales. Start your Furniture Online Shop! Looking out for the best furniture online shopping website development company? Then, think about EWDC! We offer one of finest ecommerce websites enriched with ultimate selling features that let your customers browse easily about what they are searching for. Customers can sell home furniture, kitchen appliances, sofas, beds, mattresses and other interior design stuff with our fully dedicated furniture ecommerce shopping cart platform! Responsive to all device screens, custom based platform, multiple payment gateways are some of the options that makes us the best choice to build online store for furniture retailers. The furniture ecommerce website is best compatible for furniture wholesalers, manufacturers, retailers, suppliers and other people who deal with furniture selling or reselling business. Build your very own online furniture shop with EWDC and see your business blooming with sales just like pepperfry and urban ladder. Get started today by checkout our free live demo! 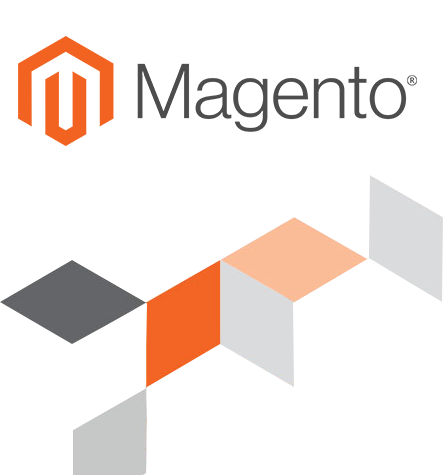 Magento eCommerce platform offers powerful and flexible online shopping experience to your customers with its intuitive interface and newest technologies. Its professional feature gives you the control over the look, and functionality of your online shopping store driving real-time data-driven solutions for your business. Due to its scalable features and optimal performance, Magento eCommerce platform is being chosen by 1 of every 4 online businesses. 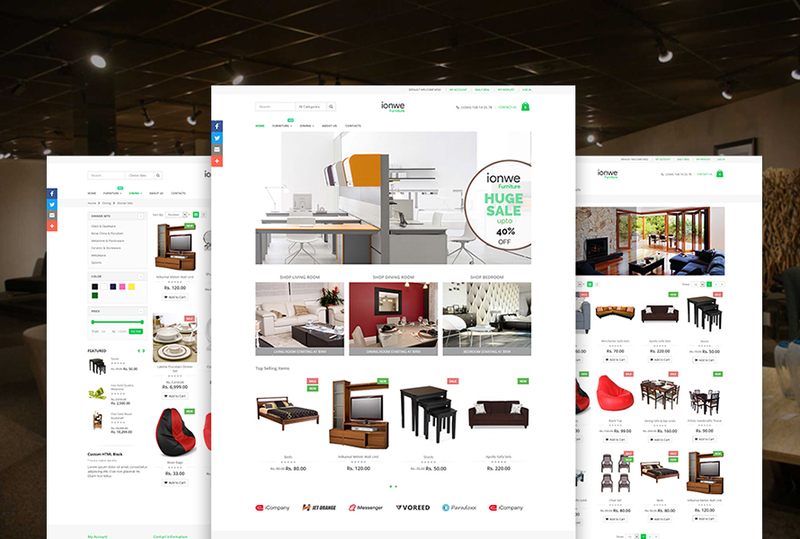 If you are one among such online furniture retailers who is in need of the best in-class eCommerce software to build your website with unique business needs, try our platform today! Looking to build multi-vendor furniture eCommerce platform for your online store? EWDC offers a complete solution for marketplace multi-vendor stores with extensive features that help you sell more products from different sellers on a single interface, increase customer base and gain commission on every sale. EWDC’s multi-store Fashion eCommerce system allows you to operate multiple storefronts on a single administration panel. You can have multi-sites and serve customers of different location with unique content with just one backend interface! Sell more with Hybrid Android & iOS Apps! Create Hybrid mobile apps for your Furniture eCommerce store with EWDC’s affordable mCommerce solutions. Get your mobile applications beautifully designed for iOS and Android platforms and reach your customers on the go. The eCommerce mobile apps works on real-time syncing and the changes made on the web store instantaneously get reflected in the phone app without any effort. What credentials should I provide you to install your readymade furniture eCommerce script? We will just ask you for the domain and cPanel details of your website along with the data such as logo, content and your furnishing product details or catalogue in .csv format that are to be loaded on to your furniture shopping cart website. How does your free installation support work? We make all the necessary setup and installation that are required to start your website and sell online. With our easy-to-use interface and reliable eCommerce furniture platform, we can build your online store filled with essential features need to run your online shop. What server do I need to run the furniture ecommerce software? In order to give hassle-free shopping experience to the customers, your online furniture selling website must have a 24*7 web hosting on a high performance secure servers. Do you provide support after the product purchase and how much it cost? Yes, we offer one year support for every product platoform purchased from us through phone, email or live chat via Skype and Teamviewer. You can also avail further assistance from our web development experts by paying additional cost that could be discussed during the point of purchase to have 24*7 support. You can easily integrate your furniture online shopping website with several payment processing services to accept money from multiple payment providers. We support multiple payment gateways which include PayPal, E-Billing Solutions (EBS), PayUBiz, PayUmoney, CCAvenue, Billdesk, etc. integrated to the furniture ecommerce script. Do you support Cash-on-Delivery (COD)? Yes, we do accept cash on delivery of the product from our end. However, the cost depends on your requirements, features of your online furniture website, its functionality and other constraints.